Darumaji is a temple belonging to the Nanzenji branch of Rinzai Zen tradition in Nara. The temple appears in the Nihon shoki (Chronicles of Japan) entry for December of the 21st year of the reign of Emperor Suiko (613), as well as in the later legend (from late-Heian to early Kamakura-times) and the temple maintains a tradition of having been founded upon the legendary story of Prince Shōtoku and a starving man at Mt. Kataoka, who turns out to be none other than Daruma Taishi (Bodhidharma). The temple has achieved some public interest and attention due to the crystal quartz reliquary in the shape of a Five Elements Stupa and the stone Hokyoin pagoda excavated from (what is said to be the starving man’s grave) below the main hall (see below). 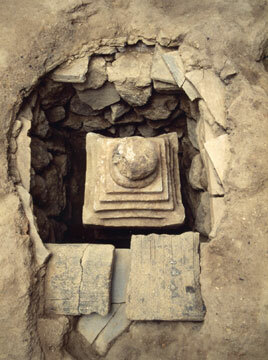 During repairs to the main hall, a small stone chamber was detected with a stone stupa deposited in upright position. A square hole had been carved into the body of the stupa, in which a haji ware lidded vessel had been placed, within which a quartz crystal reliquary in the shape of a Five Elements Stupa was found, in which a relic had been placed. A stone stupa, ordinarily erected above ground, being deposited in an underground stone chamber in upright fashion, is exceedingly rare. 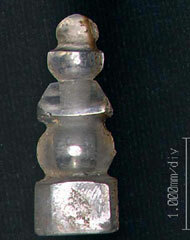 From a typological examination of the artifacts, including the stone stupa, and the results of investigations in the vicinity of the main hall, the deposit is inferred to have been made around the mid 13th century. As the grave (kofun) of the starving man, held to have been an incarnation of Bodhidharma, was repaired at about the same time that Darumaji was founded, it is thought that the stone stupa was deposited in connection with the repair of the tomb. These artifacts and features may be evaluated as showing a new facet of Buddhist relic belief that was popular nationwide in the Medieval period. Were you born without parents? Without a lord prosperous as a bamboo? The dying beggar tale gets developed with more embellishments with later version over time (see p. 54, The Prince and the Monk…), along with the enlarged sage and eventually kami status of Shotoku Taishi.